After a bit of a hiatus, I've recently been concentrating on developing my pet project, teamtasks again. 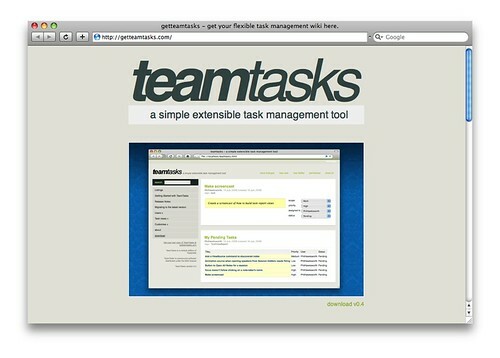 Teamtasks is a simple application built using Tiddlywik. This little project is by no means new. I have been tinkering with it for quite a while but have been working on other projects so teamtasks has had to sit patiently in the corner and wait for me to get back to working on it. Rather gratifyingly, quite a few people had seen the early work on teamtasks and expressed interest in using it for all manor of purposes. The attention made me realise that it was time to promote teamtasks from its place in my playground (version 0.3 can still be found there for those keen on glancing in the rear view mirror) to the big time! Or at least, a place of its own. And so getteamtasks.com was born. From there you can download the latest version (v0.4 at time of writing) and configure it to fit your task management habits. This is an open source project and I'm doing my best to resist the urge to tinker with it until I think that it's perfect before letting it out into the wild, so you may find things about teamtasks that don't work perfectly or you just don't like. If that's the case, then please let me know, or better yet, fix it and then show me. I'm living by the old "Release early. Release often" mantra here and welcome contributions, in the form of suggestions, bug reports, bug fixes, enhancements, criticism, praise, sticky buns, pats on the back, or hugs. Along with the new site and new release, there is a new way to get in touch and keep track of developments. Obviously, you can leave your comments here, but now you can also follow teamtasks on Twitter. You'd get to hear about teamtasks developments if you just followed me on Twitter too of course, but then you'd also be subject to other random utterances. After just a few hours of launching getteamtasks.com, I have already had a nice response. This really helps to keep me motivated and on track. As the project gains a little momentum, it also gains more pairs of hands to do the work. We've spent some time here at Osmosoft today planning the next set of enhancements for teamtasks which will soon be listed on the site for you to inspect.